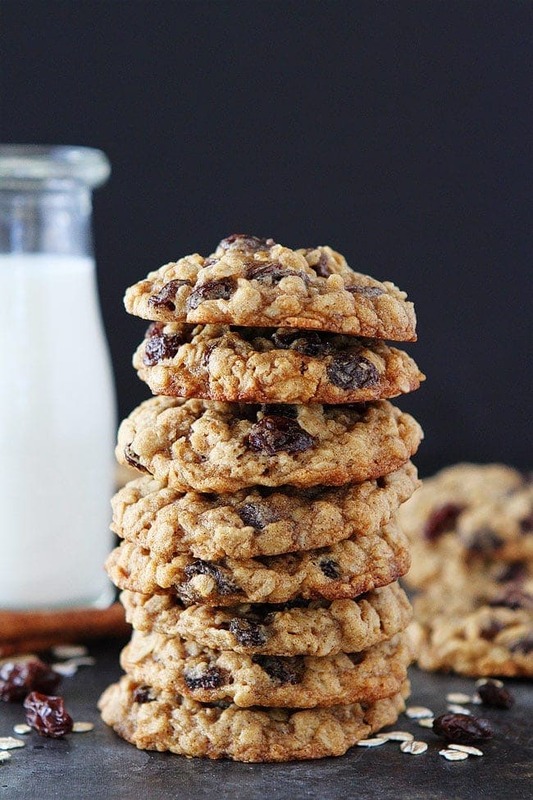 These soft and chewy oatmeal raisin cookies are a family-favorite! This classic cookie recipe is easy to make and goes great with a glass of milk. 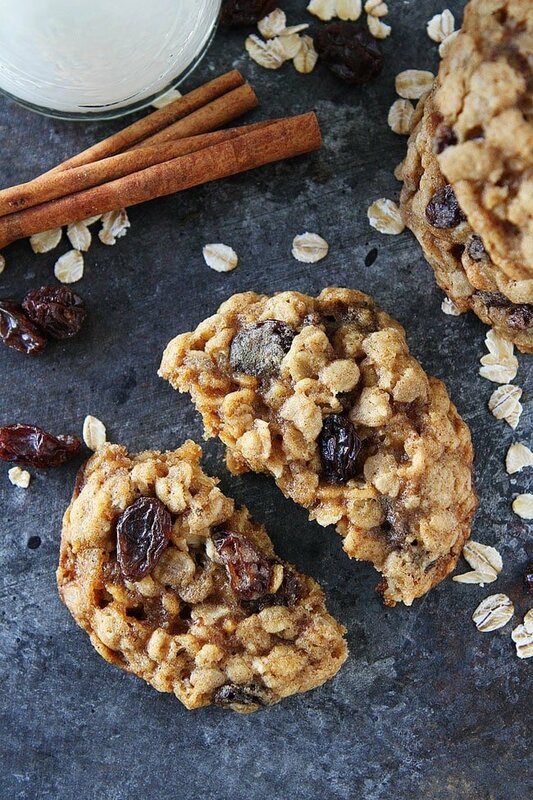 Seriously one of the best oatmeal raisin cookie recipes you’ll ever make. We went on a road trip and I made a batch of Chewy Oatmeal Raisin Cookies to take with us. Cookies are a necessity for road trips, especially these soft and chewy oatmeal raisin cookies. They are PERFECTION! They are the BEST oatmeal raisin cookies out there. I have tried a lot so trust me on this one. I grew up loving oatmeal raisin cookies because my dad LOVES raisins. Oatmeal raisin cookies are a classic cookie. My dad would always make homemade cookies for us and oatmeal raisin were always one of our favorites. I grew up eating these cookies and they are for sure a family favorite! 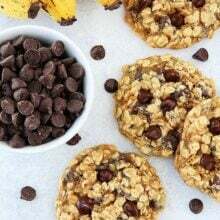 How do you make oatmeal cookies with raisins? It’s SO easy! 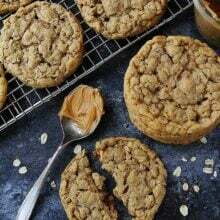 We start with a chewy oatmeal cookie recipe. I really like this cookie recipe because it is so soft and chewy. The butter, brown sugar, and oats make the cookies super chewy. 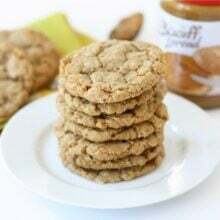 This recipe has ALL brown sugar and no granulated sugar creating a super chewy cookie. To plump up the raisins, soak them in hot water before adding them to the cookie dough. Just make sure you drain then well and dry them on a paper towel so they don’t add too much moisture to the cookies. I use old fashioned oats for this recipe, not quick oats. I like the bigger, chewy oats! Good oatmeal raisin cookies need to have cinnamon and a little pinch of nutmeg. The spices give the cookies so much flavor. 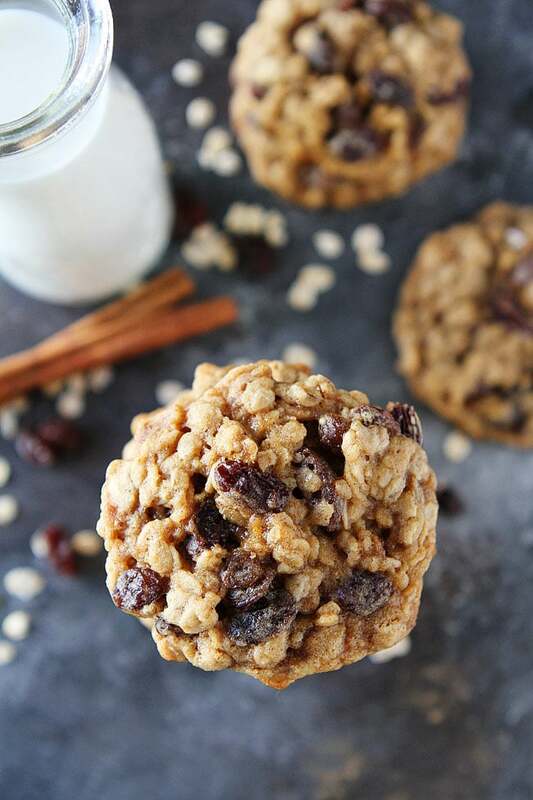 This is the PERFECT recipe for Oatmeal Raisin Cookies! They are a classic and I hope you enjoy them as much as we do! These soft and chewy oatmeal raisin cookies are the BEST! Preheat oven to 350°F. Line a large baking sheet with parchment paper or a Silpat baking mat. Set aside. In a small bowl add the raisins and cover with water. Let them sit for five minutes. This will help plump them up. Make sure you drain them well and let them dry out on a paper towel. In a large bowl, cream together the butter, brown sugar, egg and vanilla until smooth and creamy. In a separate small bowl, whisk together the flour, baking soda, cinnamon, nutmeg, and salt. Add the dry ingredients to the butter/sugar mixture. Blend until combined. Stir in the oats and raisins. Spoon about a tablespoon of dough into a round ball and place on prepared baking sheet, leaving about 2-inches between each cookie. Bake them for 10 to 12 minutes. Take them out when they are golden at the edges but still a little under baked in the middle. Let them sit on the hot baking sheet for five minutes before transferring them to cooling rack. How great that his first taste of solid food was homemade cookies – lucky him! Glad your grandpa is doing better and you got to spend time with them. Your cookies look delicious! Yum like always! I’m gonna start calling you cookie girl. Beautiful cookies. I’ve been craving for some cookies lately. I’m not prepared though. I don’t have any cookies at home. You should have stopped by my house and said hello! You all passed right by us! Maybe next time;). My brother and his wife live in Twin Falls, it’s a nice community. Im glad your Grandpa is doing OK..Im sure he felt much better after that yummy cookie! It’s so nice to spend time with our loved ones. Im sure he appreciated that visit more then you’ll ever know. I’m sure you lifted your dad’s and grandpa’s spirits a ton just by being there! And the cookies helped too 🙂 They look great. Hope your grandpa is on the mend and out of the hospital soon! Glad your Grandpa is doing better. This is just like my recipe that we loooooove so I bet these are delicious! these look so chewy and delish! They are perfect for a quick bite on the go~! There is nothing in the world like a homemade cookie, especially when it’s oatmeal. These look wonderful. These look so chewy and delicious! I’ll be thinking of you and your grandpa. one of my fav cookies because they are healthy and give you oats. glad your gramps is ok. looks like the longevity gene runs in your family. it does with me as well; my great-gram died at 100. I love, love oatmeal cookies. What a great weekend you had. So nice to have family close by. You are just the sweetest thing! I’m sure your grandpa really appreciated the fact that you were there. And I’m also sure that the cookies brought a smile to his face. They look great. Raisin cookies and grandpa’s seem to go together. How nice that you could see both your father and grandfather. I love raisin filled cookies because they remind me of my grandparents! They look delicious. I hope you grandfather is on the road to recovery.. I’ll keep him in my prayers. I made oatmeal cookies this weekend too! Oooh these look so chewy and I love a chewy cookie! I think Oatmeal cookies are probably my favorite. I will give this recipe a try! yum! The texture looks great! They look so good! Oatmeal cookies are fantastic when they are chewy! You truly are lucky to have good men in your life. I’m glad you had fun with them and was able to make something special for them. I love Oatmeal Raisin Cookies. Yours looks so chewy and moist!! glad your gramps is a strong fellow–plenty of cookies will do that for ya! you know a batch of cookies is chewy when you can tell just by looking at the pictures! good stuff, maria! prayers to your family and your grandpa. the cookies look like the perfect thing! Maria, I am so happy to read that everyone got to enjoy your oatmeal cookies. That is so awesome that you were surrounded by so much love 🙂 Isn’t it great that you could share yourself and the sweetness of these cookies! I have a soft spot for oatmeal raisin cookies. I’m going to start calling YOU the cookie girl. I appreciate that little dash of nutmeg, which makes everything better. These look fabulous–such great texture! I’m so glad to hear that your grandpa is doing better! I’m glad your grandpa is doing okay. I’m sure these cookies could make anyone feel better. I especially love oatmeal cookies when they are chewy! So glad that your grandpa is doing better and you were able to spend time with your Dad. What a fun time. My grandma was that same way–only she always wanted her coffee whenever the doctors gave her the okay. And not hospital coffee–good stuff. Our grandparents are so important to us and don’t always understand how much of a role they play in our lives! P.S. Where in Idaho does your Grandpa live? I grew up there. Hope he is feeling better. Pam-my grandpa lives in Jerome, right outside of Twin. My dad grew up there on the farm. Where are you from? Nothing like good home-made shared food to connect with people! You are so thoughtful. The cookie look delicious. Glad you grandpa’s doing better! AW, your grandpa sounds like a sweetie! I bet it was wonderful hearing stories of the good ‘ol days. I know I never tire of it and am always ready to sit and chat. Hope your grandpa continues to improve. I hope your grandpa continues to feel better Maria! I can imagine why he’d love these cookies – they look wonderful. Those cookies must have great healing powers. How thoughtful of you to take them for your menfolk. Thanks everyone for your well wishes. My grandpa is doing much better. I am sure the cookies were the boost he needed..ha! I’m g;lad you had a good time, even if it was at a hospital. The cookies look fabulious! I was born and raised in Hailey (near Sun Valley) but my parents now live near Buhl which is very close to Twin Falls and Jerome. Best wishes to your grandpa. He would feel better if he had a couple of these cookies. The best medicine! I’m glad your grandpa is feeling better! Cookies are an excellent panacea! Glad to hear your grandfather is doing better and you were able to spend some time with him and your dad. I’m sure they both enjoyed seeing you especially since you brought these cookies with you. They look and sound wonderful! I love oatmeal cookies and even more if they are chewy. I have these on my list to try. Glad to hear you had a nice visit with grandpa and your dad. Its these sorts of visits that will last forever in our mind and hearts. Oh those cookies sound so good. Glad you had a nice visit! I’m glad you spent time with your grandpa-grandpas are the best-and with oatmeal cookies how fun!! I’m glad your grandpa is feeling better now! Your cookies look so tasty and addicting! I’m so glad your grandpa is feeling better! Your cookies look so tasty and addicting! I made these cookies today and they came out well. The taste is awesome. Thanks for sharing the recipe. The cookies look great. I love the addition of the nutmeg. Right now I have no cookies in my house and my kids are really made at me! There’s just something about milk & cookies that makes kids smile (and moms too). Hurray for chewy cookies! Glad your grandpa is feeling better, would hate for him to miss out on these cookies, thanks for posting! Cookies and milk just go together. Your pictures are great. I’m glad your grandpa and dad enjoyed them! Glad you made your Dad and Grandpa so happy. All I have to say right now is YUM! Those are my favorite cookies. I finally went to the store last night and bought more flour just so I could bake cookies on Friday. Always great recipes Maria! Glad you had a chance to spend some time with your dad and with your grandpa… Glad to hear your grandpa is doing better, too. I’m sure the cookies helped… They look fantastic! grandparents are amazing and it’s important to spend all the time one has with them. these cookies look awesome maria. chunky chewy just the way we like them! Made these with my kids today, first batch is done, cooled and tested. Second batch is baking! The smell is ridiculously good! Thanks for the perfect oatmeal cookie =) For some reason mine aren’t as round as yours.. didn’t spread quite as much, but they taste delicious. I made these twice last weekend! They were delicious! Thanks so much for the great recipe. I made these last night to send to my Grandma who just moved seven hours away from us after 37 years of being within a 15-minute drive. She loves oatmeal raisin cookies and I thought I’d try this. They are – undoubtedly – the BEST oatmeal raisin cookies we have ever made. Wonderful flavour! And yes, chewy. Previously, I’d used quick cooking oats, and last night used large oat flakes – that my Grandma left with us when she moved – and this made all the difference in the world. I can’t say enough about them, or grandparents! Thanks for the recipe. So glad you liked the cookies. Thanks for letting us know! Wow, these cookies were not only delicious, but easy to make. My boyfriend loves oatmeal raisin cookies, so I made these for him on a whim. He loved them and so did the rest of my family. Thank you!!!!! Just made these. It’s so good. Thanks for posting. Next time I’ll include some walnuts. This is the only oatmeal cookie recipe I use! Soaking the raisins makes all the difference. I also make them using dried cranberries and white chocolate chips. Yum! Tried the recipe. They were amazing! Definitely saving this one. I loved that they didn’t spread too much. Lost our recipe – Thanks for helping out! These sound just like the ones Mom used to make. Great recipe! I tweaked by adding some golden raisins with the regular and chilled the dough for a bit before baking and they didn’t spread as much. The kids just loved ’em! Thank you for posting! they feel like a sponge and they need regular sugar not crunchy. I am glad I chose your recipe. The cookies came out fantastic. I got 18 humungous cookies out of the deal and I happened to use instant oatmeal (Quaker Oats). They really turned out fabulous. I also added some Cranberries along with the Raisins. Thank you so much for posting your recipe – please try her recipe to those who haven’t yet, you won’t be dissappointe!!! Yummy! i made these and they came out dry! so sad! 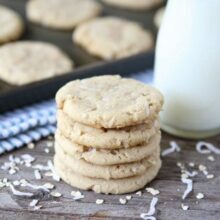 Made these after a cookie craving set in… they hit the spot! Delicious, chewey, and full of home-made goodness 🙂 Thanks for sharing! Just pulling them out of the oven, smell amazing!!! Used Coconut Oil in place of butter and used Unbalanced Almond Meal in place of flour. If I was thinking I would have used Honey in place of brown sugar but there is always next time. The cookies spread quite a bit but I make them larger than suggested, probably will increase Almond Meal next time from 3/4c to 1c. (finally cool enough to taste) Love that they taste like Oatmeal cookies and not flour with Oats in it cookies! FYI this is not my go to oatmeal cookie….the one I normally used the website looks like it no longer exists. So glad I found yours!!! My husband’s favorite cookie!! Pinning this to try!! I followed the recipe and they didn’t turn out good . Too floury , didn’t spread . Very disappointed and I bake a lot . I made it!! They were awesome!!! Love this recipe! I was in the mood for oatmeal chocolate chip so I swapped out the raisins. Can’t wait to make this again! Super delicious! And so easy. In the oven now, on a rainy, snowy April afternoon, and they smell GOOD! Must confess I ate almost an ice cream scoop’s worth of the dough raw. Hope I don’t go into convulsions, as my mother is sure would happen. Cranberries are good too! Glad you liked the recipe. Hands down THE BEST oatmeal raisin cookies I’ve ever had. Crispy on the edges, chewy in the middle. Soaking the raisins makes all the difference. The raisins stayed plump and juicy even after two days. I’ll be making these for years to come. Thank you for sharing. First time making these. Easy recipe to bake and follow. Delicious! No need to change anything. Added about 2/3 of a cup of grated carrot to this recipe it was very good. Will have to try that next time! Excellent! I have a hard time making oatmeal cookies but this recipe was so easy and turned out great! Can I double it ? Can I substitute gif flour in this recipe? Great recipe wife and I got the munchies after the kids were in bed I got the craving for oatmeal gas in, chanced upon this page and an hour later here I am typing after having eaten nearly a dozen myself. Thank you, I’ll be keeping this one! I made these last night, mine didn’t turn out soft and chewy. They were still very good. Not sure what I did wrong.